Our first attempt of “Cram the Cruiser” was very successful. @Sharpefoodmarket packaged up 140 bags- some $5 and some $10. We collected 130 of those bags, plus financial donations. Each bag had 5-6 items- juice, soup, pasta, tuna, spaghetti sauce or diced tomatoes, canned pasta and beef stew. Thank you to everyone who helped collect the bags in that hot, hot weather, and those that came to put the items away and helped carry them into the pantry. The auxiliary police were great , and wanted to help again next year if we decide to do this. 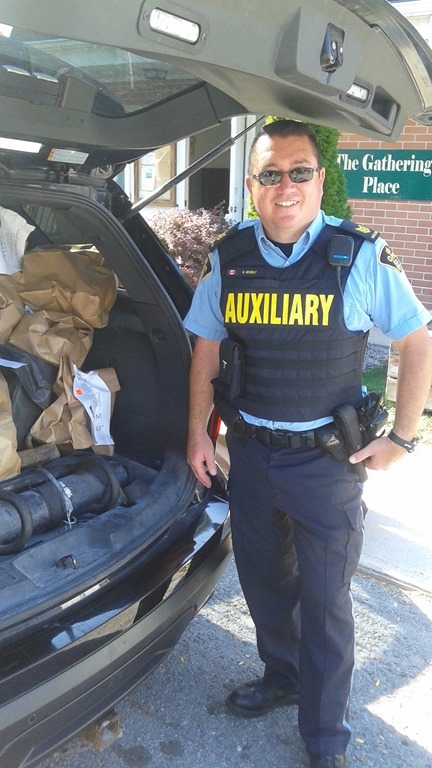 Sgt Brian Mowat from the auxiliary police helping to unload the cruiser at the 7 Hills Community Pantry in Warkworth. Thanks again for helping with this successful food drive during Hunger Awareness week. This entry was posted in Donations, Events and tagged cram the cruiser, Food Drive on September 24, 2017 by 7 Hills Community Pantry.